Inoue was hot the first part of 2005, winning his first title in New Japan when he teamed with Kanemoto to take the IWGP Jr. Heavyweight Tag Team Championship. He also took part in two of the Tokyo Dome Shows, going 0-1-1 in those. Unfortunately, the injury-prone Inoue was injured at the Best of the Super Jr. Tournament, a tournament that many felt Inoue was set to either win or make a very strong showing at. Inoue did not return in 2005, but is expected back sometime in early 2006 if things go well. Inoue had his only title shot in 2006 when he teamed with Kanemoto to go after the IWGP Jr. Heavyweight Tag Team Championship on March 19th, but they would fall to Taguchi and El Samurai. At the Best of the Super Jr. Tournament, Inoue surged to the top of his bracket, defeating Black Tiger and Tiger Mask along the way. In the semi-finals, however, he would lose to Minoru and once again failed to reach the finals. He did not participate in the G1 Tag League in December and during the fall he mostly wrestled in mid-card matches against CTU or Black New Japan. Inoue started 2007 well, winning at the Tokyo Dome and earning himself a shot at the Jr. Heavyweight Championship. On February 18th he would lose to Minoru, however, failing to win the title for the first time in his career. After feuding with CTU for much of the spring, at the Best of the Super Jr. Tournament Inoue would come in second place, losing to Milano in the finals. He did have key victories however over Tiger Mask and Milano Collection AT. On July 6th, he would team with Kanemoto to try to win the IWGP Jr. Heavyweight Tag Team Championship against TAKA and Togo, but they would come up short when TAKA pinned Inoue. Soon thereafter Inoue suddenly disappeared with little warning, and New Japan did not announce a planned excursion. Inoue would suddenly re-appear on November 11th and he would score a victory over Taguchi in a tag match. Inoue would earn a title shot against Taguchi and on December 8th he would score the upset, winning the IWGP Jr. Heavyweight Championship. To end the year, Inoue received a special match against Tanahashi, but the IWGP Heavyweight Champion was too much and Inoue submitted to the Texas Cloverleaf. 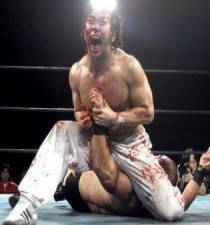 2008 saw a lot of changes for Inoue as he continued to leave his mark in New Japan. At the Tokyo Dome, Inoue defeated Christopher Daniels to retain the IWGP Jr. Heavyweight Championship. Later in the month Taguchi got a rematch, but Inoue would defeat him again. After Daniels defeated Inoue in April in a non-title match, Inoue gave Daniels another chance on April 27th and Inoue successfully defended the title. At the Best of the Super Jr. Tournament, Inoue reached the finals and defeated his friend Koji Kanemoto to win the tournament for the first time. 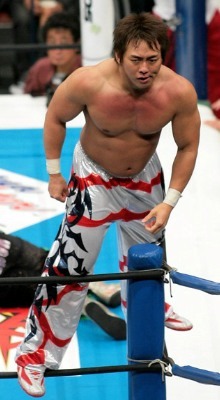 After the tournament, Inoue announced that he had accomplished all he could in the Jr. Heavyweight division and was moving up to the Heavyweight division, and in the process he vacated the IWGP Jr. Heavyweight Championship. In the 2008 G1 Climax, Inoue defeated Manabu Nakanishi and Giant Bernard but still came in last place in his Block. In the G1 Tag League, Inoue teamed with Kanemoto but they wouldn't pick up any big victories as they finished with only 4 points. On December 6th Inoue would be defeated by Takashi Iizuka, showing that he still had a ways to go to reach the top of the heavyweight division. Inoue's rise to the heavyweight division didn't go exactly has he imaged, as he continued to struggle in 2009. In the spring he entered into a feud with Ishii, that stretched from New Japan to LOCK UP and saw both wrestlers pick up wins. He wrestled in the New Japan Cup for the first time, but lost to Ishii in the first round by count out. Inoue did not participate in the G1 Climax and did not have any title challenges however, as he mostly wrestled in the mid-card gaining more experience as a heavyweight. On October 10th, Inoue had his 10th Anniversary match but he and Yuji Nagata lost to Nakamura and Ishii when Nakamura pinned Inoue. In the G1 Tag League, Inoue teamed with Nagata and the pair got four points, although Nagata got both of the falls and Inoue was pinned in the two matches they lost. Still a ways to go for Inoue to leave a mark in the heavyweight division.